Red dust, a red Moon, red skies at sunrise and sunset and even a halo around Venus have been observed and, on occasion, reported in the media - all in the last 10 years; what’s causing this and why is it happening now? Accounts of red dust during past upheaval on Earth are brought to mind, such as rivers turning red during the Jewish exodus and prophecies of future events, as in Revelations where red is a theme throughout. What should you make of it all and how does this relate to Planet X and the pole shift? The important thing to remember is that the red dust we are seeing on Earth now is NOT a sign that the poleshift is imminent; red dust that is heavy enough to result in rivers turning red is only something that happens during the last weeks before the pole shift; before then, only a light dusting occurs on Earth, more beige than red. Therefore, there are other causes for red rivers and the like that have made the news recently, for example this report in China, which was probably due to dye in the water. Red tide is also a well-known phenomenon where an algae bloom turns the sea red, and even trees can bleed blood red sap due to a faltering immune system. The extra turmoil in today’s weather systems can pick up Earth’s dust and fling it around to leave it in strange places, and when Taylor Glacier in the Antarctic started oozing blood red water, that was due to trapped red dust from a prior poleshift! Where does the red dust come from? Red dust comes from the massive tail that trails behind Planet X during its travels. The tail, which contains moons, boulders, gravel, dust and gases is the reason why Planet X is described by witnesses during a pole shift as a dragon, a mythical creature with a long, twisting tail. The tail originates from when the solar system itself was forming, but mainly from trash picked up after the asteroid belt was created; each passage causing more and more debris to be captured in Planet X’s gravitational and magnetic pull. The red dust is of course the reason why Planet X appears to be red despite being mainly a water planet. The dust is charged and so does not drift down to the surface of Planet X due to gravity but rather is influenced by the planet’s magnetic field which keeps the dust suspended in the air. Thus the inhabitants of Planet X, the Annunaki, do not see any stars from the surface, they have to send probes well aloft to escape the fog of dust which only gradually dissipates as distance is attained. How come we are seeing the dust on Earth now? When Planet X entered the inner solar system in 2003, the repulsion force with the Sun kicked in and it slowed almost to a halt while the tail drifted on, past the Sun, and started licking the Earth which was on the other side of the Sun at the time. This was when the first reports started coming in of people seeing red dust effects, although the establishment had the Sahara lined up as an excuse. So in 2004 when Planet X was rounding the Sun’s South Pole, the charged tail did not point towards Earth, but was glued to the Sun as you would expect with two magnets in close proximity, until early 2005 when Planet X gradually rose to the ecliptic and started moving outbound towards the Earth. This resulted in the return of red sunsets and red skies as Planet X’s North Pole swung about as it changed from aligning with the Sun’s South Pole to the North Pole. Now, in 2014, Planet X has moved closer to the Earth and the Tail now points more directly our way, as opposed to the left where it been observed for the past few years, as shown in some of Alberto’s photos below. What can we expect to happen as time progresses? Continued light dusting, red skies and red moons can be expected up until the last weeks when the heavy red dust occurs, turning the rivers and ponds red and giving the water a bitter taste. Will the announcement change what the media tells people? Unlikely, as the media is controlled by the elite who will still try and contain the truth. Car owners in Siberia could be forgiven for thinking a biblical plague had descended upon their city, after finding their vehicles soaked by blood-colored rain in a Norilsk parking lot. Photos of the phenomenon showed the parking lot and cars coated in brownish-red residue from the rain. But the owner was quick to reassure everyone there’s no calamity in store for the city. According to him, blood-red water was simply colored by rust from the roof of a nearby workshop. The parking lot in Siberia’s major industrial center is located next to a metal plant. SAHARAN DUST HEADED FOR TEXAS ☀️Haze Alert! Dust from the Sahara Desert has spread across the Atlantic and is expected to reach Houston area by the weekend. 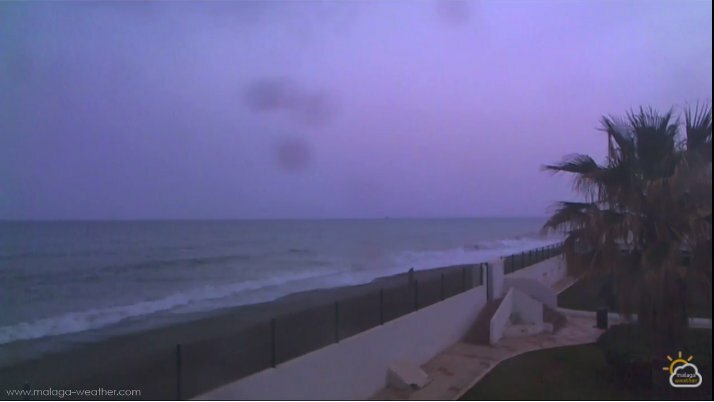 The dust is now contributing to hazy skies in the Caribbean. Expect the haze to spread into Texas over the next few days. Health warning: If you have allergies, Asthma, lung issues, COPD--it's advised to stay indoors. Fox 26 Meteorologist Mike Iscovitz with new forecast alerts. A severe sandstorm struck al-Muthanna province in southern Iraq on Friday, engulfing the landscape in a red dust. Ahmad Qasem, a resident of the town of Samawah took footage of the red glow. 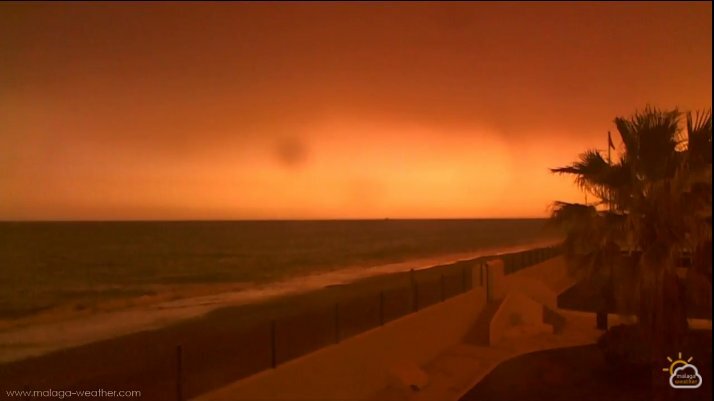 The video shows the impact of the red sand, darkening the skies at around midday. Parts of Iraq often suffer from dust storms, especially in the past decade, as strong winds sweep up Iraq's vast deserts, blowing sand and dust into urban areas throughout the country. Researchers say climate changes within the region have added to the problem with a decrease the annual rainfall and environmental changes, such as drying of the marshes, land degradation, and desertification. "Evolution of the sky over Malaga at sunset. We have rarely seen such a reddish hue on us. The little rain that has fallen heavily loaded with mud." A freak weather incident has turned the snow at cities in Russia, Ukraine, Bulgaria and Romania orange – and people have been left scratching their heads as to why. Snow-covered mountains and ice-capped pinnacles have been turned into sand dunes after becoming blanketed by the dirty orange snow. While ski resorts – including at one in Sochi where the Winter Olympics were held in 2014 – have also been covered by the strange snow.